This is the first in what I hope to be a series of pieces on the immigrant experience as viewed through a food lens, which I believe offers a unique approach to appreciating the cultural richness of our community. — A.M. I am playing sous-chef in her aroma–filled kitchen because Hatice, whose daughter and mine were good friends all through Berkeley High, graciously agreed to teach me to cook something from her homeland, Turkey. We’re making dolmas, (meaning “filled things” in Turkish). 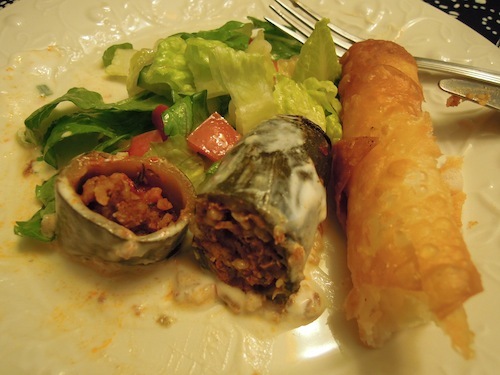 Turkish cuisine features many stuffed vegetables: peppers, okra, squash and eggplant. We chat as we prepare the meat filling that will cook inside hollowed out zucchini tubes and special small eggplants that you can’t get here. Every time she visits her family in Turkey, Hatice brings back bunches of hard, dried eggplant halves, strung like necklaces, whose gourd-like skins produce a pleasant clacking sound – to the consternation of U.S. customs officials. We put them in a pot of boiling water to soften. 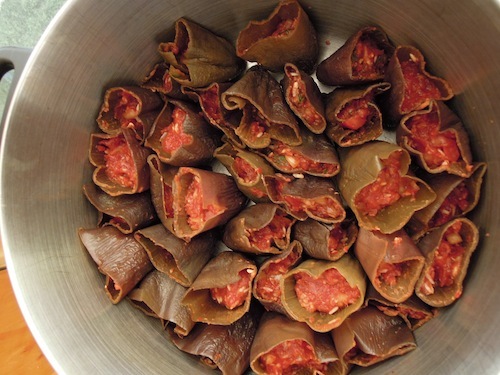 As we scoop out zucchini innards and drink endless tiny glasses of tea, Hatice plunges into her story of growing up in Istanbul, in an observant Muslim family with her parents and 5 sisters. Now we stuff the zucchini with the meat and rice filling, but only 2/3 full, because the rice will expand while cooking. Hatice tells me she got married at 17 through a matchmaker. We stand the stuffed zucchini halves upright in a pot and tackle the cooled eggplant. A little more challenging because their softened skins tear easily. Now we add some butter to the pots – but not as much as in Turkey, where Hatice says they like a lot of butter – and heat the covered pots on the stove until they sizzle. After we hear the sputtering sizzle of vegetables, Hatice adds some water. 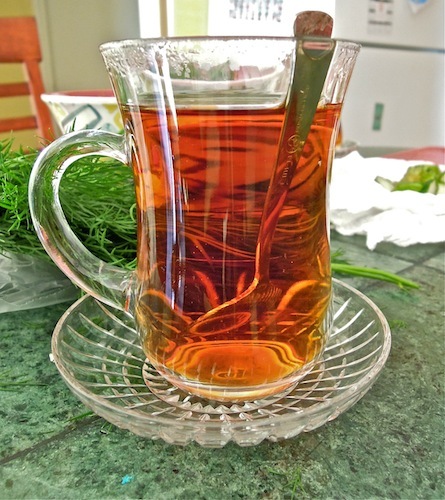 While the dolmas cook gently for another 20 minutes, filling the house with an enticing aroma, we take our tea into the living room, where Hatice continues her story. “The other Turkish women and I decided to ask the people at Indus if they could get us the foods we really missed. We made lists of what we needed. They were very nice and said they would try. 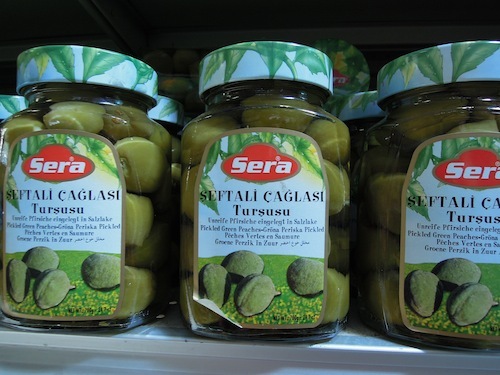 And their wholesaler in LA found us lots of Turkish products. Now they carry so many things: a variety of olives, jams, cheeses, yogurt, Turkish coffee, soft drinks, cookies, halvah, pickled unripe peaches and hot cabbage. We head back to the kitchen where our daughters, Lila and Beyza, chatting happily after their first year at different colleges, are making a salad. 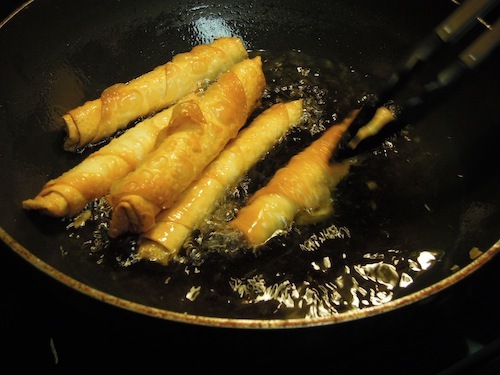 Then Hatice’s 6 year-old daughter, Sara, asks her mother to make sigara borek, fried pastry rolls filled with feta. 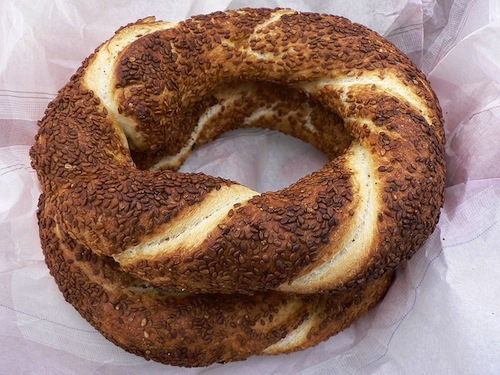 As I crush garlic with a marble mortar and pestle for a yogurt sauce for the dolmas, Hatice fries the golden brown borek and tells me how food helped her make the adjustment to living in America. And food helped me make friends. My neighbors in the first apartment building were Asian and Mexican-American. I invited them over and then went over to their places. We learned to cook each other’s dishes. One neighbor didn’t speak much English, so I learned by watching how to make quesadillas and chicken enchiladas. My kids love my enchiladas, but they say it still tastes a little Turkish. Less saucy and lighter, not too spicy, I guess. My Asian neighbor taught me how to make fried noodles. I taught them Turkish pastry and salads. As we all sit down to the lovely dinner, I remember the first time I met Hatice a few years ago, she was acting on her belief that food helps people bridge differences. She invited us, through Beyza, to attend a culinary cross-cultural event at Berkeley’s Congregation Netivot Shalom. 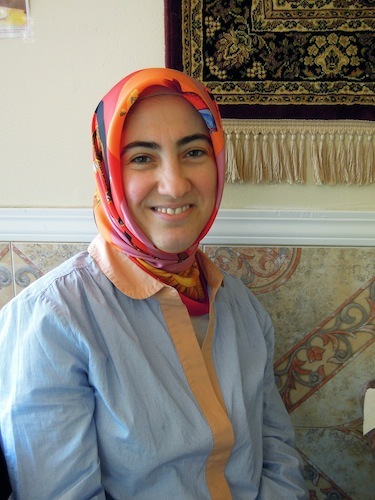 Hatice and her husband are members of Bay Area Cultural Connections (BAYCC), a Turkish Muslim group that organizes interfaith exchanges. That Sunday, four women from BAYCC spent 6 hours (with the help of 4 women from the temple) preparing two large pots of ashure, enough to feed 100 people. 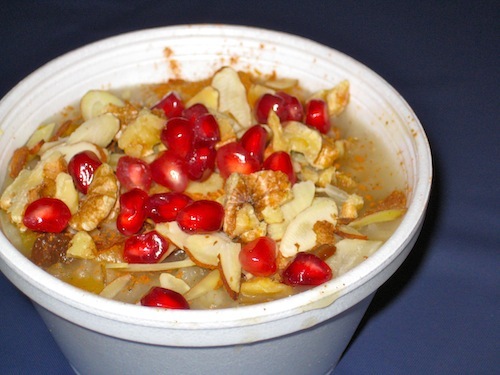 Ashure is a porridge-like pudding that commemorates the landing of Noah’s Ark. When the ark finally alit on Mount Ararat, in northern Turkey, those on board wanted to celebrate, but their provisions were almost gone. So they cooked up whatever food was left into a festive pudding. I felt touched that the women had spent hours cooking this special dish so that we could taste it and compare our cultural traditions. One of the oldest desserts in Turkish cuisine, ashure is a warm medley of barley, wheat and garbanzo beans, topped with nuggets of dried fruit, nuts, sugar, cinnamon and pomegranate seeds. The tradition is that one makes a large pot of ashure, to share with friends, neighbors, classmates and co-workers, regardless of their religion as an offering of peace and love. Put a large pot of water on the stove. 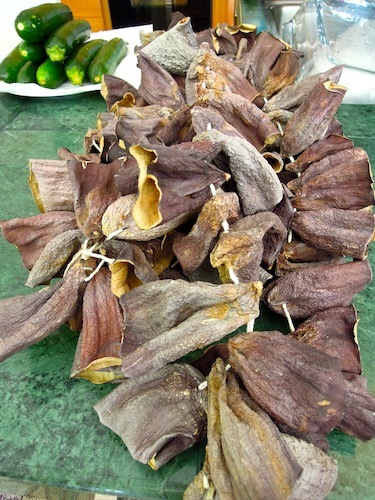 Bring to a boil, then put in necklace of dried eggplants (still attached by string). Cook 15-20 minutes until soft. Drain, cool, cut string and gently remove. 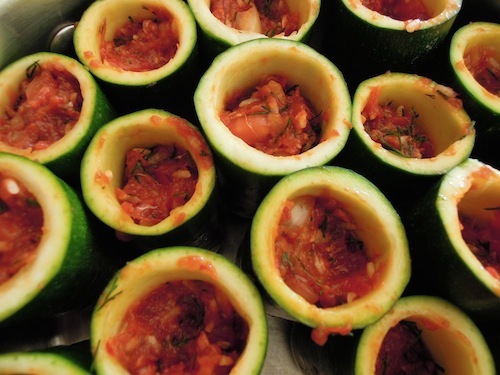 Meanwhile, prepare zucchini by cutting them in half and hollowing out each half with a knife. Leave the ends on to hold the stuffing and about 1/4 inch around the sides of the tubes. Set aside. In a large bowl, mash diced onions and salt. Add ground beef, rice, tomatoes, and pepper or tomato sauce, ground black pepper. Add 3/4 cup water and mix well by hand. Divide meat filling in half and add chopped dill to one half. Use the dill stuffing for the zucchini. Fill about 2/3 to the top. You need to leave room for the rice to expand. Stand them on end (open ends up) in a pan large enough for them to nestle comfortably against each other. Fill eggplants with the other half of meat filling, again only 2/3 of the way to the top. Stand on end in pan large enough so they will fit but not so large that the fall over. Cut up butter and add a 1/2 stick to bottom of each pan. Put pans on top of stove, covered on low heat. When you hear the butter sizzling (after about 15 minutes), add 1 cup of hot water (in each pan) and continue cooking: about 15 minutes for the zucchini, about 25 minutes for the eggplant. Serve with a few crushed garlic cloves in plain yogurt. This entry was posted in Immigrants' stories, Turkey and tagged Ashure, BAYCC, borek, Indus Market, Netivot Shalom, Sigara borek, Turkish dessert, Turkish dolmas, Turkish food. Bookmark the permalink. What a pleasure to read this story! Looking forward to more tales of immigrants and food. Thanks, Rachel. Yes, I’d like to write several more pieces looking at the experience of immigration through a food lens. I am planning to interview people from Denmark, Israel, India and other countries, too. Great article and story… merci! Marion! So nice to hear from you. It’s been a while. Hmmm…just thinking maybe I could interview about your experience coming here as a French immigrant. Please contact me (amindess@aol.com), not sure if I still have your contact info. What a beautiful job you did on this story, Anna. I love that you honored a home cook and told her story. Thank you, Dianne. I felt honored that she shared her story with me. I have a feeling that tracing immigrants’ food journeys can convey a sense of their challenges, transitions and universal themes, like loss, comfort, identity, and adaptation. Look forward to doing more interviews to see what they bring to light.